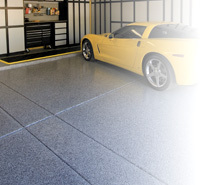 Slide-Lok's special formulated Epoxy floor coating is finally here! If you have been waiting for the right time to get your garage floor coated, there couldn't be a better time than right now! Our Epoxy coating is made from 100% solids, and is solvent based. Time tested our epoxy coating has proven protection against motor oils, gasoline, antifreeze, brake fluid, and even hot tire pick up. Epoxy coatings are very durable and cost-effective for many applications such as garage floors, play rooms, kitchens, patios, driveways, sidewalks, basements, barns, warehouses, etc... We offer a 2 and 3 coat flooring system, one (1) coat is installed per day (6-8hr tack free time). A normal 2 car garage will take two (2) days to install (2 coat system), and requires a 3-5 day return to service time. Compared with other flooring products Epoxy is in a class of its own. It simply cannot be beat by the price for the advantages that it offers. Being about 1/3 less expensive than polyaspartic, epoxy holds its own. For larger flooring applications such as warehouses, and other industrial spaces epoxy is ideal for its long pot life, durability, and clean-ability. Don't wait any longer, contact us today to get your free quote!